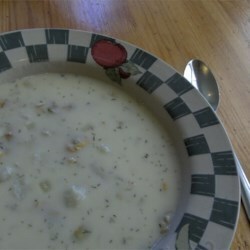 Rich hearty clam chowder. Serve as a meal with bread rolls. It's as easy as making curry! It's much better than the store bought cans. Difficulty: intermediate - the flour is the most difficult part. It has an tendency to clump. May require practice before addition. add more butter,oil,or water slowly if necessary to hydrate flour. If it becomes like dough, add more butter, oil or water, it should be like paste. Depending on how packed the flour is, you may have to add more oil/liquid. Add a little cold water to dissolve 1 cup of corn starch. Note: You will probably need a large stock pot to make this. The onions will give a sweet flavor when cooked. Make sure they are translucent. Also check for tenderness of the potatos. The flour will thicken the whole soup. It will be watery without it. Adding it straight to the liquid will lead to clumps. Slowly moisturizing it with oil/butter will prevent that. Make sure you keep it moist, if it starts getting dry, add more liquid. Add flour slowly. Then slowly add some of the clam juice to the flour to continue to hydrate. Beat it until it all dissolves. Make sure there are no clumps of flour. This may require some practice. You can also substitute 1/2 the amount of cornstarch for flour. Add corn starch to cold water, dissolve and then pour into soup. This is the most difficult part, if you feel the flour slurry has too many lumps or isn't working, you can just use 2 cups of cornstarch or whatever amount necessary to thicken soup. Make sure you add plenty of salt. The flavor really comes out when salt and pepper are added just right. Since you are making the clam juice from the clam base, make it a little more concentrated. I tend to add 1.25-1.5x the recommended amount to bring out that clam flavor. It is not that strong and needs to outcompete the other flavors, especially since the flour tends to mute down everything else. Another favorite addition is 2-3 slices of bacon chopped finely and pan fried with or without 1/4 cup shredded chedder or parmesan cheese. Yum! Me: Tom, how do you prevent the flour from clumping? I followed your instructions, but 2 tbs of butter just can't magically do away 4 cups of flour! Tom: Did I say 2 tbs? I meant two sticks! Tee hee hee! Yeah... sorry, I think I didn't multiply it up correctly when I adjusted for 30. On second eval, it should have been 2 sticks of butter. I'm going to try to make it and figure out the proportions...stay tuned.